The company Rayner Appliance Care is run by Mark Rayner who has been involved in the domestic appliance business for over 30yrs, gaining a wealth of experience over this time in which to provide appliance assistance, so that your back up and ready for action in no time. 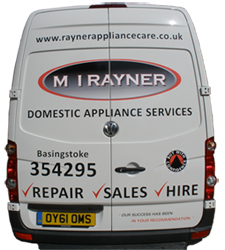 Rayner Appliance Care is in Basingstoke and is serving the local community of Basingstoke and surrounding areas. We have worked hard to ensure that all of our customers are satisfied with our work. We are proud to boast that we are highly regarded in our trade thanks to the thorough and professional service that we provide to our customers. We are Trading standards approved,showing our commitment in the trade, of white goods. I am sure that you have seen our vans around town many times over the years, Our success has been built upon your recommendations of us working for you. We are your truly local domestic appliance services company. Our success has been built upon recommendations and our constant top quality service to all our customers. Not quite covering your area? Feel free to contact us anyway, we're pretty flexible and can probably still help out.